Anna Maria Horner: Coupla things & Happy Thanksgiving! Coupla things & Happy Thanksgiving! Its gonna be a short work week & I wanted to stop in first and share a few things, and if you're on the mailing list, sorry for the overlap in info, suffer through it or click through pilgrim! * First and most important, I fully intend to wear one of two things over the next several days : an apron : or : a pile of yarn- under which I will be making things I don't need and maybe a few gifts for people who don't need things either. * I have a new collection of aprons and dishtowels in the shop and I am super excited to say that included in this group are some fun little girl aprons~My girls are always tying my half aprons up to their underarms, so they are giddy with anticipatory-holiday-baking excitement over these! * Overwhelmed with thankfulness for all that we have, I know I'm not the only one who'd like to spread a little love around at this time of year. And without a doubt there are more families in need these days than ever. 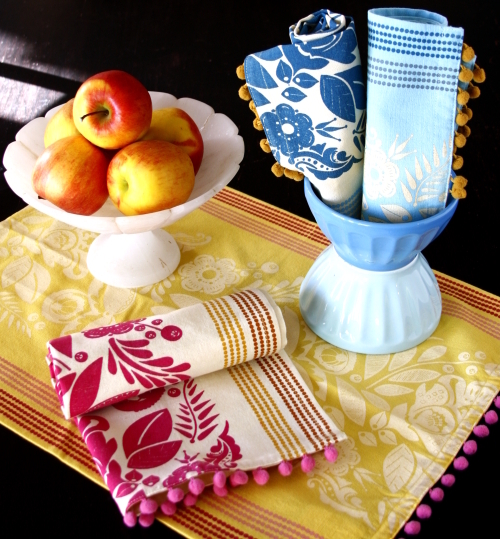 We will be donating a portion of all of our kitchen linen sales for the rest of 2009 to help feed hungry families in our area. So this a simple way for you to shop for yourself or to gift a loved one, and help us with a worthy cause. * My Folksy Flannel collection is here, there and everywhere! * Be sure and check back in next week for a giveaway and more about the fuzzi-luvi properties of these fabrics. I've been sewing a bit with them for the family and want to share. * Roman just turned six months old and I have given up on the floor quilt thing most days because he seems to find his way off of it before I am back to my chair. For a while the quilts that we put down got bigger and bigger, but now I am realizing that I am just going to have to sweep the floors more. * Isabela has resolved to keeping her hair long instead of cutting it short because she says its good for thinking. When I asked her to clarify, she said you know when you're taking a math test and you have to run your fingers through your hair to figure out a hard problem. Of course. * I want to paint the dining room white. * I'm thinking I should not try to do that before Thanksgiving. * Though I do think a roasted turkey would look so pretty surrounded by creamy-white walls. * Roasted turkey fingerprints on creamy-white walls would be less pretty. * Less pressure to make sense. oh when, oh when, will your little folks dobby (esp. the square dance?) be available on retail. OH! I love it so much from the pictures! Thank you for sharing your talent with us all in this way! Love the flannel!!! Enjoy your family this week!! I think your dining room goes perfectly with turkey as is. Although we have the exact same buffet, unpainted, and seeing your sometimes makes me feel like painting ours. I'm also super excited about the linens-- perfect little hostess gifts and I love the ball fringe! How wonderful to have beautiful bright flannel instead of just pastels! 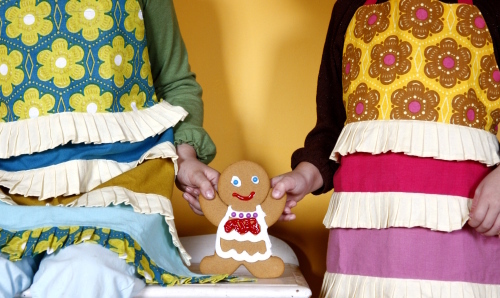 Your children's aprons are adorable. Maybe if I made my tweens some aprons they would help more in the kitchen? It's a possibility I suppose. Love Roman's cute little rolls. could just eat him up! I love that you would even consider painting before Thanksgiving. It makes perfect sense to me, you should always add a little pressure to every situation! Love the linens and what a lovely idea to share the wealth. Good for you Anna Maria. I love that apron! It has such pretty details like the vintage aprons do. Your work is inspiring! Happy Thanksgiving! That picture of Roman kills me everytime. And that 1st one? Wow! Happy Thanksgiving. You are in the middle of some very interesting times. It's wonderful to hear of such creative success. I love a fresh coat of paint! Happy Thanksgiving to you too! I already ordered aprons--one for me and one for my 3-year-old granddaughter. Maybe we'll wear them when we make salt dough. Aprons are the best! Beautiful family and fabric!! You make someone that has never sewn want to give it a try. Your fabrics are marvelous! Hope you have a happy and safe Thanksgiving. PS: don't forget to make a Folksy Flannel Flickr pool :) can't wait to receive my fabric !!!!!!! I hope you and your wonderful family have a perfectly beautiful Thanksgiving, Anna! I think (and talk) about you often and love reading your blog. May The Lord's richest blessings be yours! I totally understand Isabella's Hair theory. Makes sense to me. I'm Canadian, so we did Thanksgiving last month (which is consequently also my birthday...you know, some years) but Happy Thanksgiving to you and yours Anna Maria! Happy Thanks Giving to you too! Lovely table linens! Also, I totally agree with Isabella's Theory of Long Hair. That's wonderful! Isabela is right...my hair is down to my waist and I can't tell you how many problems I have solved using the fingers through the hair technique! I think a creamy-whitish dining room would be just the ticket...after Thanksgiving though! I have been making Play Dough for about 9 years - this recipe keeps very well in the fridge. The important ingredient, in addition to the vegetable oil, is Cream of Tartar, then you need to add heat. Happy Thanksgiving AM, We have a lot to be grateful for, don't we ? Thank you for sharing your beautiful family with us, have a good one!! What a beautiful little boy you have! I've just found your blog and have been following it for a few weeks from UK. I love your bright and intricate fabrics - it has inspired me to pick up the sewing needle. I'm making felt stockings for my family this year. I'm sure my 8 month old won't care, but he will in future years!! Happy thanksgiving to a talented family! Tell Isabela she is right! I always did that at school too and it helps! You can of course also do it with short hair but it's nicer when it is long. A couple of years ago I happened to read an article about why this running your fingers through hair is so good. Apparently you run your fingers through your hair over your head, thereby massaging the head, which improves the bloodflow, which in turn improves your ability to think! So it's scientifically proven. Something to tell them Isabela when they laugh at you! You are SO right!! Best wishes for a wonderful Thanksgiving! in the middle of renovations, etc. and just used a very yummy kelly-moore paint called, "Maybeck Muslin"...started with just trim and ceilings in every room...then decided to do our whole bedroom (so I could add some fabulous AMH fabric!!!! * oh, I am foggy brained lately because I cut my hair. * I just painted my studio white--it is lovely, but the clutter looks clutterier. * what are you knitting? with what yarns? I am in a funk that Rowan discontinued its chunky print yarn. 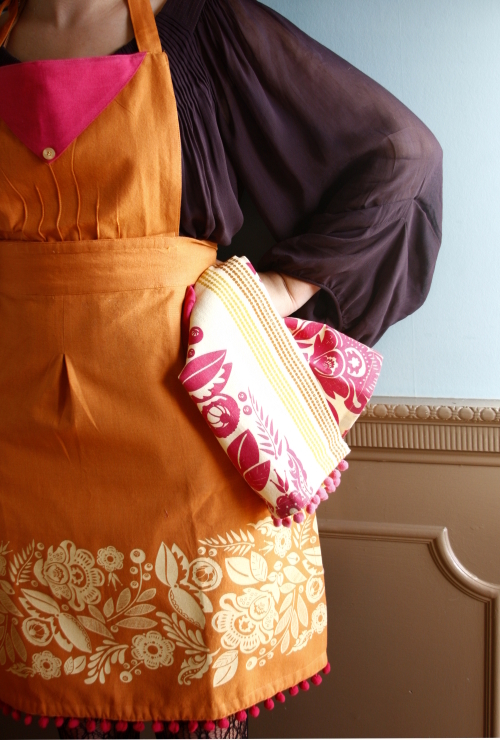 * have a lovely thanksgiving in a lovely apron. I never cease to be amazed at all of the things you get done, you with your passle of children, your book, your sewing, your success. How DO you do it? I love the banner pic and Roman is adorable! I enjoy your blog so much. Thanks for sharing your life and philosophy with all of us. Happy Thanksgiving to you and yours. I love love love your new flannels. I'm going to make PJs for me and my daughter with those. I also love all your aprons in the collection. They are too cute. As the mommy of a darling boy, I want to say BOYS love to cook, too (especially if you watch lots of FoodTV with them as I do), and they also love aprons! Though not, of course, floral ones usually, if they are over, say, 4. Beautiful stuff. I have just discovered designer fabrics which has rekindled my interest in quilting. Is that beautiful flowing blouse from your solid voiles? Please say it is! I'm sooo excited to get my hands of some of them! 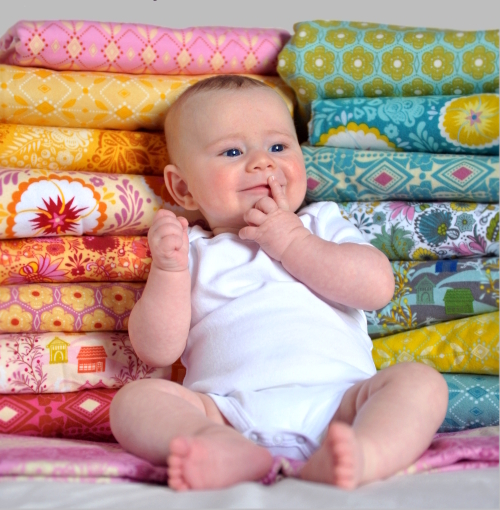 Precious babies and gorgeous linens! Absolutely beautiful! Your designs inspire me to get sewing! I found your site on google, great site, keep it up. Will return in the future. Submitted this post to Google News Reader. Please come visit my site Business Reviews Of Columbus City when you got time. I found your site on google, great site, keep it up. Will return in the future. Submitted this post to Google News Reader. Please come visit my site Columbus Business Phone Book when you got time. You share valuable information and excellent design you got here! I would like to thank you for sharing your thoughts and time into the stuff you post!! Thumbs up. Please come visit my site Hialeah City Directory when you got time. You share valuable information and excellent design you got here! I would like to thank you for sharing your thoughts and time into the stuff you post!! Thumbs up. Please come visit my site Phone Directory Of Hialeah City Florida FL State when you got time. I have a great salt dough recipe that I use to make dough for school- I will try to remember to post it!!! Glad I stumbled into this article! Finally, got what I was looking for to put on my school report... Thanks for sharing this. Please come visit my site Atlanta Phone Book when you got time. Glad I stumbled into this article! Finally, got what I was looking for to put on my school report... Thanks for sharing this. Please come visit my site Atlanta Business Directory Forum Blog Classifieds when you got time. Stumble on away on or after home how to facilitate make a undo cell phone search or a telephone search otherwise even a reverse phone lookup number lookup lookup so at what time to unearth absent who is trailing with the aim of qualities so whilst to has been calling you this entire instant ok. I enjoy this nice swap mobile phone search otherwise cellular phone search or else telephone number lookup spot. I be capable of learn much of cell phone lookup things on rearrange telephone lookup here in the present day as soon as I check elsewhere this guide here.